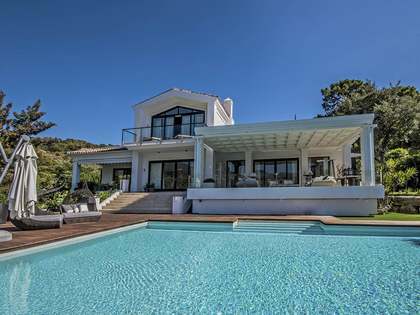 This magnificent 5-bedroom villa is built on a 4,366 m² plot with a superb south-western orientation within the La Zagaleta Golf and Country Club, featuring panoramic views of the golf course. The stunning property features a marvellous outdoor heated pool area complete with pool bar, jacuzzi and an extraordinary pool house with barbecue and inside a fantastic entertainment area, including home cinema, and spa area with heated indoor pool, gym, sauna and Turkish bath. The ground floor comprises an entrance hall, living room with beamed ceilings and fireplace, dining room, fully fitted kitchen, utility room and storage, guest toilet, lounge and 2 bedroom suites with dressing rooms and terraces. On the next level are 2 storage rooms, toilet, a garage for 6 cars and machinery rooms as well as large storage area which also could be used as staff accommodation. On the first floor is a master bedroom suite with dressing rooms and terrace a large lounge and a second bedroom suite. The basement comprises 1-bedroom staff quarters and the entertainment area featuring a party kitchen, sitting area and bar, TV area with fireplace, home cinema, wine cellar and storage. The spa area includes sauna, steam bath, shower, heated indoor pool, gym and direct access to outdoor pool. On this level there is also a machinery room with a separate entrance from the garden.